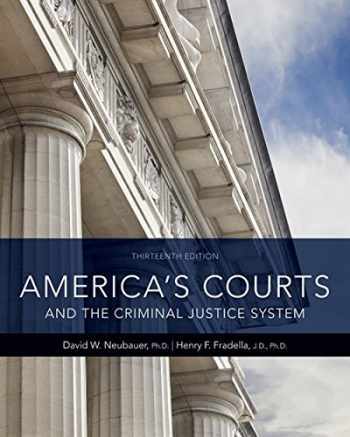 Acknowledged author David W. Neubauer wrote America's Courts and the Criminal Justice System comprising 648 pages back in 2018. Textbook and etextbook are published under ISBN 1337557897 and 9781337557894. Since then America's Courts and the Criminal Justice System textbook received total rating of 4 stars and was available to sell back to BooksRun online for the top buyback price of $74.36 or rent at the marketplace. Open this book and step into America's court system! With Neubauer and Fradella's best-selling text, you'll get an inside view of the experiences of a judge, a prosecutor, a defense attorney, and more. This fascinating and well-researched text gives you a realistic sense of being in the courthouse, enabling you to quickly grasp what it's like to work in and be a part of the American criminal justice system. The book's approach, which focuses on the courthouse "players," makes it easy to understand each person's important role in bringing a case through the court process. Throughout, the authors highlight not only the pivotal role of the criminal courts but also the court's importance and impact on society as a whole.